Big day for new citizens, big day for America - Integration Through Media ....! By Manoj Rijal, NEW YORK: It was a big day for Karina Borbon – the end of an impatient as well as a passionate wait of 10 years to be an American citizen. 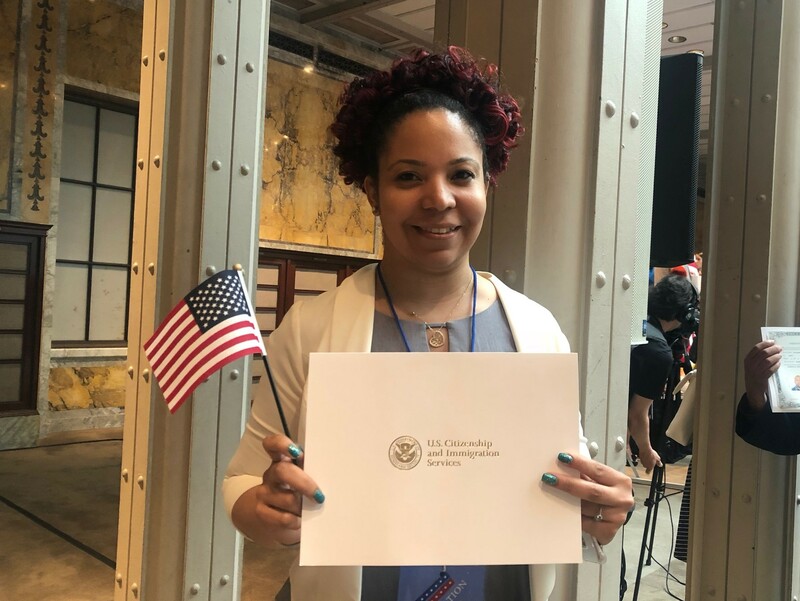 Borbon, who was born in Dominican Republic, was going to be an American citizen after 10 years of her living in the United States and proving that she is a good human being and could be a good US citizen, too. 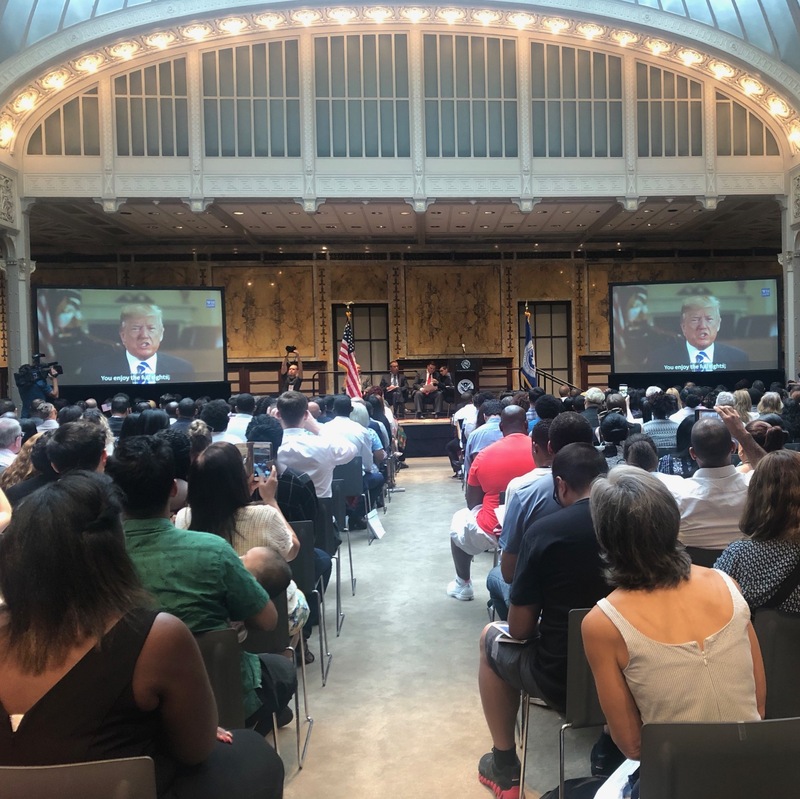 Borbon was one of the 200 individuals, who were honored as the new American citizens amid a ceremony at the New York Public Library at the 5th Avenue on Tuesday, July 3, 2018. The 200 individuals were born in 50 diverse countries of the world including Nepal, Israel, Sri Lanka, South Korea, Kosovo, Ghana, Lebanon and France, among others. “Today marks the change of day for you,” Dr. Tony Marx, President of the New York Public Library told the assembly of the new citizens. “Congratulations, my fellow Americans!” Timothy Houghton, the USCIS Deputy District Director for New York District, told the gathering amid applauds. “You have now an opportunity to make positive contributions for your country – the United States of America!” he said. Houghton administered oath of office to 200 new citizens in the ceremony conducted by Scott Velez, the Supervisory Immigration Services Officer of the USCIS for the New York district. President Donald Trump also conveyed his video message to all the ceremonies held across the US for the new citizens. In his message, he has congratulated and welcomed the news citizens. According to the USCIS, a total of 14,000 new citizens will be welcomed this year during 175 naturalization ceremonies across the US organized from June 28 to July 10, 2018. The ceremonies would mark the birthday of America or the 242nd independence day of the US on the fourth of July.